I had a great opportunity to play a concert with some fine musicians right before Christmas. A number of months ago, jazz guitarist/composer Colton Weatherston approached me about combining Armenian and Middle Eastern music with jazz rhythms. This is not a new concept truth be told, but it would be somewhat new to me and Colton is a great musician and I loved the idea. 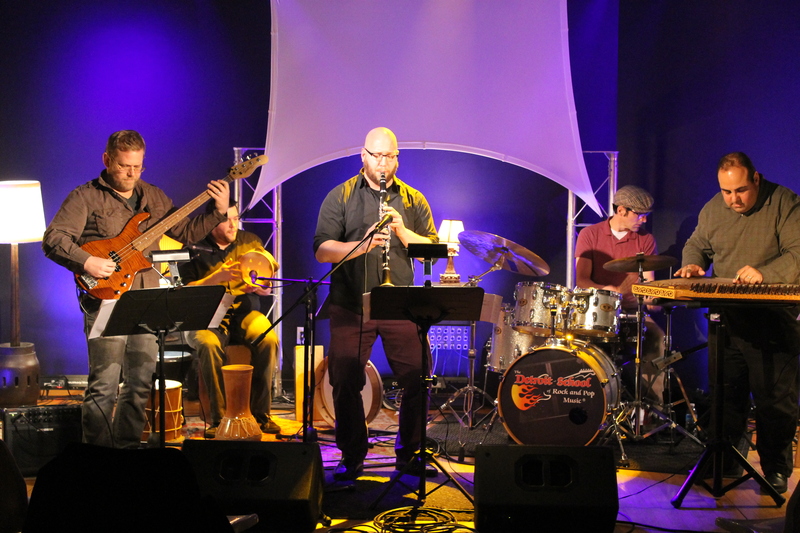 He assembled a cast of great local artists which included Rob Avsharian on drum, Michael Shimmin on Middle Eastern percussion, Eric Schweizer on clarinet and Colton provided the bass tones. With only one rehearsal, we took to the stage in Royal Oak at the Detroit School of Rock & Pop, a great location and business headed by Jason Gittinger. This is a small venue but a warm one that provides artists the ability to preserve live music. I was very impressed with his facility and business. Oh, and he is a great drummer too! We didn’t have a big crowd, but as I said earlier it is a small venue. We did have a group of loyal fans and friends that came out which increased the warmth of the room. We had a blast. The music was pretty good, consider the fact that Colton lives out-of-state and this was the first time any of us played together like this…I had only played with Mike Shimmin and not the others. I was excited after our first and only rehearsal…only hours before the gig. We played songs such as Armenian folk tunes Ambi Dagitz, Hele Hele, and Antranig. It was a great night with some great musicians and music. I hope we do it again real soon. Until then…we need a name for the band! This entry was posted in Gigs, Uncategorized and tagged Armenian, Arts, Bass, Clarinet, detroit, Drums, Folk music, kanun, michigan, Middle East, Middle Eastern music, music, Royal Oak. Bookmark the permalink.